Two things I can tell you for sure about producing a CD. 1. It always takes longer than you think. 2. It's completely and totally worth the extra time and effort. There comes a point in any worthwhile endeavor that you have to buckle down and put in that last effort that pushes a project from "good" to "take-my-breath-away-good." I had to have Brad remind me of this many times these last couple of weeks as we have been wrapping up my new CD "The Dawn and The Dusk." He has been the Yin to my Yang and I'm getting all teary-eyed thinking of how lucky I am to have him by my side. They say it takes a village to raise a singer and this proves true with the team of talented folks that came together to make "The Dawn and The Dusk" so special. There is our sound engineer, Mark Stephensen, who has some of the best sound in western music coming out of his MAS Studio. Rich Dixon, Michael Dowdle and Ryan Shupe are all top-shelf musicians based in Utah. 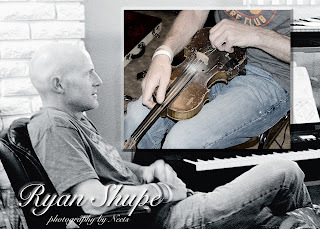 My friend and photographer, Anita Crane, came to the session that Ryan played in got these shots of him. I can't even tell what a thrill it was to record at Allegro Studio in Texas with Dave Alexander. When Rich O'Brien walked in to the session to do the guitar work I about wet my pants. I wish you all could have heard Mustang Mikki doing her first studio work ever as the background vocals for Wyoming Woman, Montana man. I can still hear Dave telling her, "Use your woman voice, honey." And boy, did she. So much of the music I wrote for this CD was inspired by the Southwest and there was no better artist to catch the Arizona light than my friend and photographer, Lori Faith Merritt, who battled rain and one of the coldest days in Arizona to create the warm feeling for "The Dawn and The Dusk." The graphic design is from a talented designer named John Stevens in Spring City who is now a permanent member of my "team." Often I am asked what draws me as an artist to Western music. That's an easy answer. I am drawn to the folks who are drawn to this music that is as real and raw as they are. Western music is the last great frontier in American Roots music. It is as yet a largely undiscovered treasure that has been overshadowed by it's Nashville cousin. I'm proud to create my work on this frontier and see great things on the horizon. I once read a bumper sticker that said, “I wasn't born in the West, but I got here as quick as I could.” The Dawn and The Dusk brings the West to you in all of it's diversity and depth. Thank you for all of you who already have your orders in. This Utah gal really appreciates your love and support.